Last week, credit rating agency Standard and Poor's threatened to downgrade the AAA credit rating of the United States of America by issuing a "negative" finding on the 'long term credit outlook" for the country. The firm's report said that Congress wasn't working diligently enough to reduce the budget deficit. The nation had better fix things quick or, as S&P threatened, "there is at least a one-in-three likelihood that we could lower our long-term rating on the U.S. within two years ." The mere threat of a reduced credit rating brought calls for quick and decisive action on proposals for deficit reduction. Of course, decisive means cuts to social programs and the continued hijacking of payroll taxes intended for Social Security recipients. Where else will The Money Party steal the cash flow to reward themselves with bailouts, defense and more wars, plus those proposed subsidies for nuclear reactors? Why the rush? Why do we have to decide to accept a right-lite budget offered by the White House or a Medieval version of the nation's future from the ultra right? Is S&P that smart? Is their reputation beyond repute, their objectivity unquestioned? Or is this some cheap political ploy for the continued subsidy of the financial elite by citizens? S&P issue a variety of credit ratings. Investors use those ratings to evaluate the safety of purchasing securities and bonds. If a company, state, municipality, or financial product gets the highest rating, AAA, that tells investors that the entity is very unlikely to default on its debt. If S&P assigns a lower credit rating to corporate, municipal or state debt, then the corporation or government entity ends up paying higher interest rates for current and future debt. Higher interest rates divert funds from company revenues or government budgets due to higher interest rates. In the case of governments, that means fewer services. Did S&P and Moody's have a sudden epiphany about their ratings of risky investments? The Senate investigation found that S&P succumbed to pressure for AAA ratings from Wall Street and big banks for their very risky mortgage backed securities (MBS) and other financial instruments that fueled the real estate bubble. That pressure resulted in high credit ratings while, according to the report, S&P knew from 2003 on that there were "increasing risks" in the MBS market. It seems S&P succumbed to pressure from their customers on Wall Street and the big banks. 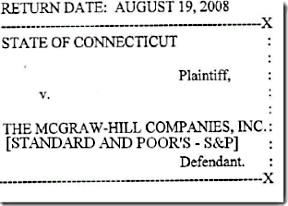 "S&P Intentionally Underrates Public Bonds"
The heading above is a section title from the 2008 State of State of Connecticut complaint filed against S&P for "unfair and deceptive acts and practices in the courts of trade or commerce within the State of Connecticut." "We are holding the credit rating agencies accountable for a secret Wall Street tax on Main Street"
Section V of the complaint, referenced in the heading above, teaches us something about how S&P treats government entities. Here's a credit firm that takes money from local governments and citizens by issuing ratings it knows are flawed. This is the same credit rating firm wielding major influence on the US budget process. There is no doubt that S&P's influence will work against the interest of citizens. There are bad actors operating with ill intent. They seek a grand solution to that pesky problem of public debate and citizen involvement in major decisions. William Grieder summarized the dialectic from here on out: "If you listen closely, Obama is setting himself up to fashion another grand compromise with the right. He will explain this is the adult thing to do" April 20. This citizen cram down will occur without the least bit of citizen involvement. They hold us in total contempt. We are nothing to them. why a s&p in the first place? s&p originated as a resource for capitalists uneasy with risk. over time like a fungus spreading s&p found itself in a great business, popping up all over the globe with its "you pay me money, i'll give you my opinion" model. a great way to clean up the hanky panky at s&p would be to require the company to pony up cash to reimburse losses. Citizens are held liable for expenses, particularly small business. But S&P gets to help inflate/crash the economy on distorted information and nothing happens. The Connecticut suit is a model for other states. We'll see if they get on board. The irony here is that S&P is part of McGraw Hill. They make about 40% of their money on text book and other educational sales. Their advice may end up costing them quite a bit of money (although they'll make it up on the financial publications end of the business). We're led by fools. Yes, legislate 'em, regulate 'em and litigate 'em. Seriously. Hound them until corporate media (including e.g., NPR News) can no longer announce any S&P rating story without the news agency looking ridiculous if they do not at least mention the tarnished image of what may at one time (long ago) have played a valid role in keeping markets sane and healthy. S&P is just another branch of the Money Party. Another great piece from Michael Collins. They should have run the story with a laugh track. It would have been an accurate take. There's no there there. That's an excellent cleansing program below. It would be a nice gesture to find a place for Duck Fuld on the rehab team, maybe strategic consultant. It's their downgrades on sovereign debt which create these pressures on PIGS, to sign up for "austerity". See S&P scolds the U.S.. But to me they have way too much power over sovereign states. Then again, I recall Goldman Sachs getting Greece into some sort of CDS game as well. If we can be scolded by S&P, I should be investing in Enron, and if I have any problems with the IRS, I should call in Arthur Andersen, LLP, to clean up my books. After that, I should be able to get a AAA from S&P. LOL, wrong "which corporations are in charge now"
What if the world, every single person on the planet, all on one day, at the same time, places shorts and puts on these companies? Now that....would be a political statement.